Before I jump in, some of you might ask “What is happening? 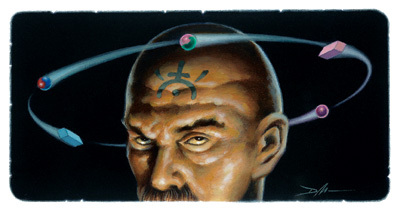 Why aren’t you writing about Dark Sun?” I fully intend to do that. The ravages of convention season plus some work helping other authors has taken a toll, as have family pressures. Further, my Dark Sun campaign is in a very great phase of players making PCs. That ends this coming Wednesday, and at that time I hope to share a lot more about my campaign. I am also comparing Obsidian Portal and Epic Words and hope to share that when I next post. If you read just one blog this month, it should be what Robert J. Schwalb (the guy that writes every other Dragon article) wrote in a blog post (Edit: no longer on his site) entitled Reexamining the Dungeon. He brilliantly analyzes the way that 4E’s formula for encounter design ends up producing fantastic tactical combats… but then the adventure and players end up revolving around this. The tactical combat becomes everything, and this robs us of the diversity of experiences usually present in D&D (and other RPGs). The analysis is fantastic. The solution is also innovative, though I am not sure it goes far enough. He proposes using the concept of “Sectors” that encompass a slightly larger budget than one encounter but then spreads out the components over several dungeon rooms. You only get a short rest when you complete the sector. This allows the DM to shift the emphasis from combat to a combination of combat, exploration, RP, skill use, etc. This has lit a fire in many. Responses from Mike Mearls and other major WotC minds has spread to other blogs and forums. Chatty DM was writing about this on his blog. He was mentioning quests (and some other concepts) and Chris Sims was talking about not using traditional XP-granting mechanics. It all led me back to the game needing a better top-level building formula that addresses the larger story/campaign needs. Not everyone needs this. Great DMs with great players can create a setting/story/campaign that really evokes lots of RP, exploration, and non-mechanical interaction. But, the general system influences the vast majority of gamers and causes damage. Skill challenges are something that in theory could have codified RP moments. We see this in Living Forgotten Realms or D&D Encounters, where an SC is placed where a loosely structured investigation would take place. The open format becomes a framework that begs everyone to just roll dice. It is rather hard for the average DM to conceal that a tally is being kept and that this is an SC. Metagaming begins. Despite tons of material on official and other sites, this remains in today’s game. Quests are also attempts to codify story elements, which in theory would be very rich. Instead, what we codify is MMORPG-like obvious interactions. NPC deploys hook, PCs accept, they do, they get XP. Yawn, and it just begs for metagaming. Also, the quest XP idea really stresses obvious accomplishments that tend to include combat. You recover the lost book by slaying the monster. You end the town’s threat (through combat). Etc. RP-decisions seldom are part of a quest or the focus of a quest. It all adds up to be a recipe for what we see today – mechanics driving our play style. Just like “sectors” can act as an umbrella for encounters and potentially reduce the mechanical feeling of XP budgets, we need something that can codify the need for a diversity of experiences within the adventure itself. One idea is that of “Goals”. A Goal would be an overarching building block concept that encompasses traditional quests as well as Sectors, SCs, and Encounters. You might replace XP at the combat and quest level with Goal XP, which is the true budget keeper. Or, you might use traditional accounting and simply award XP when Goals are completed. In designing an adventure or a campaign you would break down the story into goals, each of which would have a variety of components. Importantly, goals would mirror story arcs. You can have several goals and trade out components based on the different approaches. Goals can conflict, yet share components. Goals could be dynamic. You might look at Temple of Elemental Evil and have many goals that are possible based on alliances made, foes defeated, information gained, etc. Dealing with the fire temple can be a very rich goal that allows for a lot of options (alliances, setting another temple against them, skill challenges to infiltrate, working with external allies to defeat them, freeing captives, etc.). Another way to do it is to have “Checkpoints”. You can award the XP for reaching a certain progression point in the campaign. Maybe we start in Hommlet and need to choose NPC allies, establish relations, find info, uncover and resolve some problems. Checkpoint reached, XP given. Now we need to get to and explore the moathouse. Checkpoint reached. Now we need to… Many DMs already award XP this way, but by codifying it we suggest to DMs that they choose from a wider menu of options than the combat encounter and skill challenge. In Living Forgotten Realms, for example, authors work hard to mirror suggested 4E XP budgets. This forces 2 or 3 combats per 4-hour adventure, either of which can lead to way too long a play experience and frustrating sameness. If you compare this to Shadowrun or Legend of the Five Rings or Spycraft living campaign 4-hour adventures you see real differences. These other systems don’t force a budget and just reward the overall concept of what is being accomplished. The result is a much more open type of gameplay. You see players coming up with all sorts of ideas. A one-paragraph mention in a Spycraft mod of how a villain likes race cars led us to an extended awesome scene where the “Wheelman” PC raced the villain Bond-style for high stakes that further the mission (true story). In L5R, you can see entire mods without combat and players love it. You do things like have your samurai enter a poetry contest because of Clan and the societal concepts. Suddenly you find yourself writing a haiku your swordmaster is about to recite! This exists in the adventure in part because the author was not led to create a certain type of adventure. In Shadowrun, delivering the goods to the fixer is what matters, not whether you beat up Lone Star cops and four street gangs or simply outsmarted the foes. What most good DMs do, it seems to me, is use the awesomeness of 4E to build really cool tactical encounters, but they space those out further based on their knowledge of earlier editions and other RPGs. But, the inexperienced DMs or the ones that feel they must follow the literal page end up trapped into making very formulaic adventures. This means we need to change the overall formula that leads these new gamers astray (and hurts organized play). And it isn’t just solving encounters with Sectors (a brilliant idea). It goes all the way to how you build the adventure itself. This entry was posted on October 2, 2015 by Alphastream and tagged 4E, Ashes of Athas, Authoring, Challenge Level, Pace.